This weekend was a biggie…me and my Dad spent last weekend unrolling, insulating, and hanging PEX pipe under the house to each bathroom and the kitchen. Thirteen different runs…probably around 350 feet of 1/2″ PEX pipe. 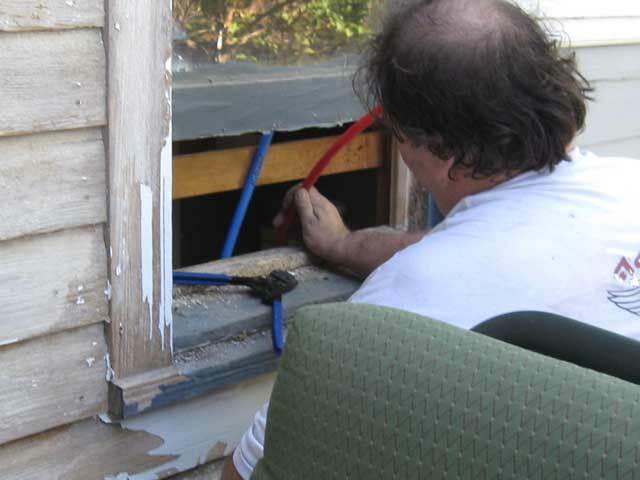 The idea was that THIS weekend, we would cut the old plumbing at the main line into the house, hook up the PEX manifold to that, and then spend the rest of the day cutting the old pipe out, snaking the new PEX through the floor, and hooking up each tap. The main line to the street…was to be another project for another day. That WAS the plan…of course, since it was plumbing…you can probably guess how well that went. That manifold is in our mud/utility room and will be covered by a bead-board cabinet door. 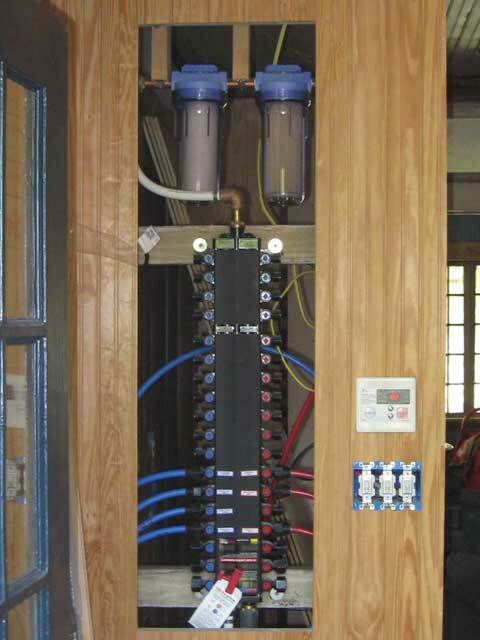 It’s sort of like a breaker box for fresh water. The idea with PEX is that each tap gets its own line back to the manifold. That makes for no joints or connections under the house or in the walls and even pressure distribution throughout. All the valves are on the manifold and if you want to turn something off, you just go there and turn the valve. That’s the controls for our new tank-less water-heater on the wall above the light switches. More about that later. The first hitch in the plan was when I found major problem in the sewer line to one of the bathrooms. The house has been empty or lightly used for years…now that there are people in it, marginal things are going to go wrong. This line is not only marginal, it’s downright wrong…and out of the about 47 things that could go wrong, 45 of them went in the last week. It’s out of service. Another project for another weekend. The second hitch was when I went to cut loose the old system from the main line and discovered…well…more than one main line. When rooting about trying to puzzle out where they all went, I scratched what I think actually WAS the main line with a crowbar and it started bleeding (rust and water). Oh boy. The main line was so rotted out there was no way to connect to it. The project just grew in scope. Off to the hardware store (10 minutes till close) to pick up 100 feet of 3/4 pex and some fittings. Ditches to dig! Yeah! My Dad, by the way, worked circles around me. He just turned 80 a few days ago and the guy just doesn’t slow down or quit! This would not have happened this weekend without his substantial help. Thanks again! An all day thing….at 10:39 pm we finally have enough stuff hooked up to where we can (hopefully) fire the new tank-less water heater and take showers. That would be good as crawling around under houses is a VERY dirty business. 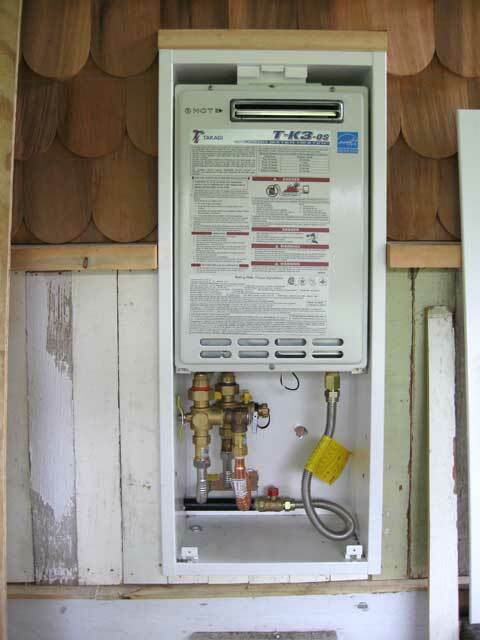 The tank-less water heater. Blessed blessed water heater. The controls are the geek factor…it will run without them…but if they are installed you can turn it off, adjust the peak temperature, and view data like the flow-rate, incoming and outgoing temperatures. It also tells you when it’s burning, which is important…as the heater itself is flush mounted in a cabinet in the outside wall, and you cannot hear it run. We got the manifold hooked up, hooked up the bathroom and kitchen, and pushed the “on” button on the controls. The we opened a faucet. Turned the gas on, and opened a faucet. Presto! Hot water! Cool! ur…Hot! Showers all around! Plenty of water! The old water heater has been trying to kill me since we got the house (that’s another story)…so this was a big…HUGE…event! I REALLY like how this works. The water is hot, quick to the taps (the PEX manifold with independent home runs for every tap helps with that), and efficient. No pilot light, and only burns when water is flowing. Oh, and there’s the carnage of the old plumbing system scattered in pieces everywhere (can you say, Saw-Zall! Woohoo!) There’s galvanized iron, NOT galvanized iron, CPVC, PVC, black poly pipe and hose clamps, PVC compression couplings, bronze compression couplings, rubber/tin clamp on leak covers, and more exotic materials as well. More stories later…leaks all around in the old stuff…glad it’s gone. Added a new faucet in the bathroom sink AND clawfoot tub (now complete with shower). All the old is gone. The new is working. A shower! A shower! Woohoo!